An awesome holiday cookie recipe…or an all year indulgence! Brown sugar, pecan cookie with brown sugar icing…seriously, what’s not to like? We hope you enjoy it and thank you to My Own Sweet Thyme for posting it. FYI: This blog is worth checking out! For your Autumn tea, try this easy & deliciously rich cookie with the taste of buttery caramels. It’s certain to become a year round favorite! 1. Preheat oven to 300 degrees F. In a mixing bowl, cream butter and sugar. 2. Gradually stir in flour. Turn onto a lightly floured surface and knead until smooth, about 3 minutes. 3. Pat into a 3/8″ thick rectangle measuring 11″ by 8″ (about the size of a sheet of lined paper). 4. Cut into 2″ by 1″ strips. Place 1″ apart on ungreased baking sheets. Prick with a fork. 5. Bake for 25 minutes or until bottom begins to brown. Remove from oven and cool on baking sheet for 5 minutes then remove to a wire rack to cool completely. Store in an airtight container 1-2 weeks or freeze for 3-4 months. You’re invited to visit Teapots ‘n More and browse our selection of English bone china tea sets, teapots, tea accessories and antique tea cups. We present for your baking & eating pleasure, our new Almond Scone recipe featuring marzipan, almonds and almond extract. Serve them with clotted cream and cherry preserves, pear conserve, orange marmalade or even Nutella! 1. Preheat oven to 400 degrees. Sift together first 4 ingredients in a large bowl. 2. Cut butter into dry ingredients until approximately the size of peas. Add the diced marzipan and two Tbsp. of the sliced & crushed almonds. In a separate bowl, mix together the remaining 2 Tbsp. of almonds and 2 Tbsp. 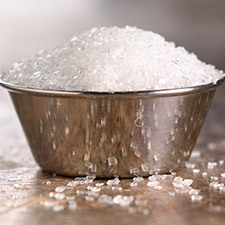 granulated sugar. 3. Measure out milk and add in almond extract. Pour the almond milk into dry mix and stir to moisten. Dough should be moist enough to form a soft ball, but not sticky. If needed, additional milk may be added 1-2 teaspoons at a time. 4. Turn dough onto a lightly floured cutting board and press out with hand to approximately 1/2 inch thickness. Tip: Do not knead dough and use as little flour as possible to keep the dough from sticking to the board. 5. Cut into desired shapes and place on a lightly greased baking sheet. Lightly brush tops with milk if desired. 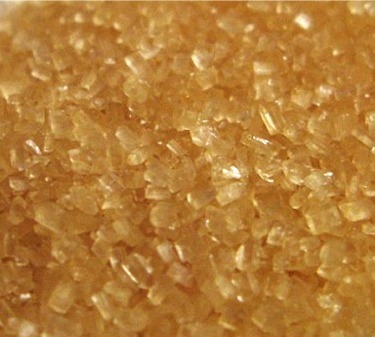 Sprinkle with previously prepared almond & sugar mix, reserving some for a second dusting after the scones are baked. Tip: If using a biscuit cutter or glass, dip the cutting edge in flour first. 6. Bake for 10-20 minutes depending on size. The 1 1/4 inch scone will be done in approximately 10-13 minutes. Scones are done when lightly golden and the center springs back. Sprinkle again with remaining almond sugar mix while scones are still hot for visual appeal. Best served within 1 day of baking with butter or clotted cream and jam. Store in airtight container if serving later in the day. Tip: When baking, start checking your scones at the minimum baking time. You can always bake longer, but overdone is ruined. What’s different? Since scones are basically a sweet biscuit, we dropped the egg. Additionally, we reduced the milk and added two Make Ahead Options. These options allow you to make scones in as little as 20 minutes. We’re especially excited about Make Ahead Option #2 which goes from freezer to oven. We hope you enjoy this new & improved recipe! 1/2 cup of one or two of the following, if desired: currants, raisins, dried cranberries, dried chopped cherries, chocolate chips, cinnamon chips, dried chopped apricots or apples, etc. 1. Preheat oven to 400 degrees. Sift together first 4 ingredients in a large bowl. Add one or two of the above dried fruits, nuts or chips or leave plain. 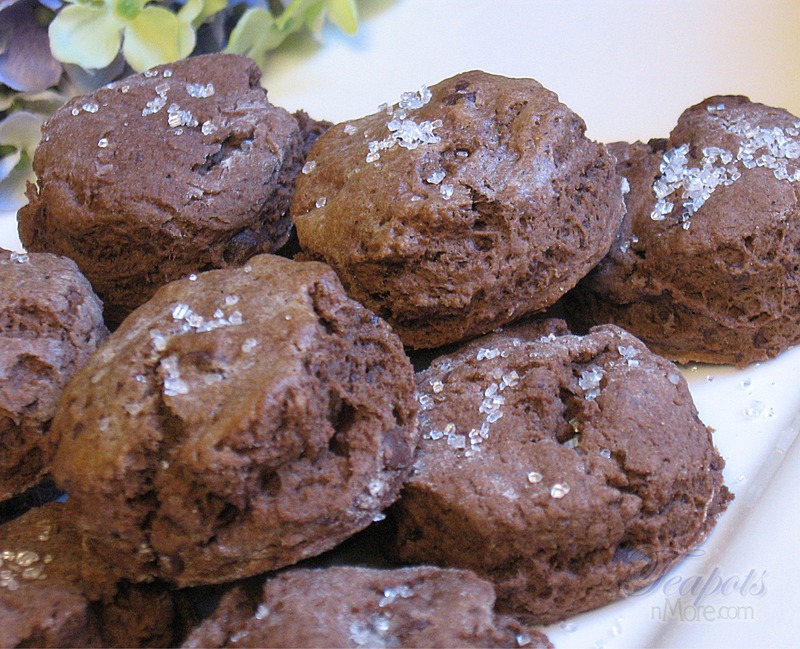 Check out our Triple Chocolate Scone recipe too! For more tips, check out our article on Squidoo: How to Make Great Scones.